Flowers are much more than a pretty sight. Did you know that they can be a death trap for unsuspecting insects? We have here a Jagged Ambush Bug (Phymata sp.) on the flowers of a Wedgeleaf Button Snakeroot (Eryngium cuneifolium). Ambush bugs are usually hard to find because their jagged bodies help them camouflage on flowers, but this one doesn’t seem to realize what color he is. Nevertheless, he is waiting motionless, hoping a juicy insect will visit his flower. As soon as that insect lands, the ambush bug will snach its head with those crab-like claws and stab it with his sharp, tube-shaped mouth. He will then drag the surprised insect down the flower stalk and sit there happily sucking the prey’s insides like a giant bug smoothie. 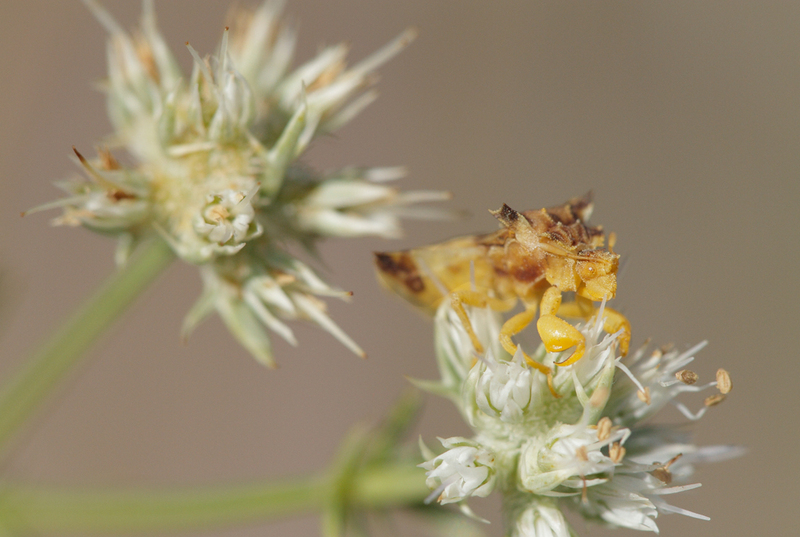 Ambush bugs are able to catch insects several times larger than themselves. Those bees and butterflies have a much scarier job that you might’ve thought! 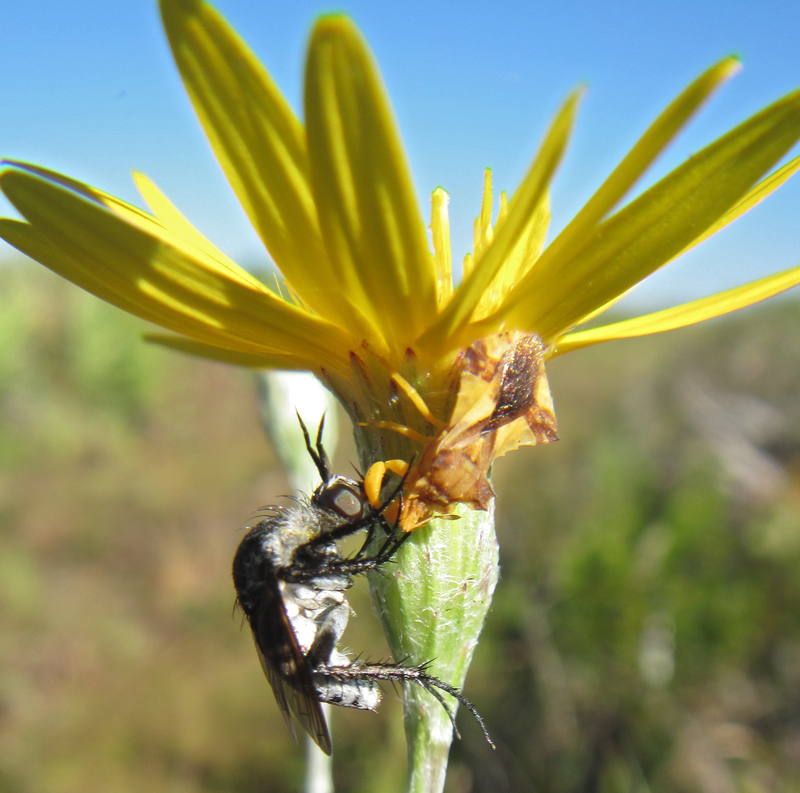 Another ambush bug eating a fly on a different flower. As if that weren’t cool enough, the ambush bug in the first photo happens to be hunting on an extremely rare plant, Wedgeleaf Button Snakeroot (Eryngium cuneifolium). It is an endangered species that only grows in dry and open sandy habitat in Highlands County, Florida. This tough plant can survive fire, drought, and natural herbicides made by rosemary plants, but not the wave of development that has swept over Florida. Archbold Biological Station is one of the few places where you can still find this plant. The Archbold Plant Ecology Program is a leader in the research and conservation of Florida’s rare plants, including Eryngium cuneifolium. Archbold’s work on Eryngium includes studies on its growth, survival, and reproduction, as well as surveys for unknown populations. Archbold Plant Ecology Intern Michael Blaha is also conducting his independent project on factors affecting the germination of Eryngium seeds. This entry was posted in Creature Features, Invertebrate features, Plant features, Station, Threatened/Endangered Species and tagged Ambush Bug, Eryngium cuneifolium, Phymata, Wedgeleaf Button Snakeroot. Bookmark the permalink. Love your blog. Keep up the good work. The video on the scrub jays was excellent.